Marines and Sailors from the 24th Marine Expeditionary Unit participated in exercise Trident Juncture 18 in Iceland and Norway during October and November, 2018. Trident Juncture is the largest NATO exercise held since 2002 and allowed for military forces to operate in a collective defense scenario. Marines initiated the exercise in Iceland where they executed an air assault and conducted cold weather training to prepare for the live exercise in Norway. The cold weather training allowed Marines to rehearse establishing a bivouac location and familiarized them with their gear in Iceland’s high winds and driving rain. After Iceland, the 24th MEU moved on to Norway who hosted the live exercise portion of Trident Juncture. Norway provided another challenging environment for Marines to train in that would not otherwise be possible in the United States. The unique climate and terrain allowed the Marines to demonstrate their proficiency in the cold weather, precipitation, and high altitude. The culminating event for the 24th MEU came Oct. 29-31 when they executed an amphibious landing and air assault in Alvund and Gjora, Norway, respectively. Eleven amphibious assault vehicles, more than 50 HMMWV’s, and six light armored vehicles were delivered ashore during the amphibious landing. 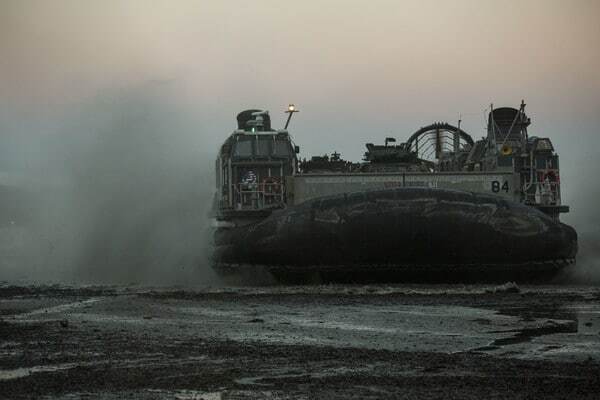 More than 20 other vehicles were moved from ship to shore and approximately 1,000 Marines were transported ashore by surface or air connectors. The air assault saw a company of Marines from Battalion Landing Team 2nd Battalion, 2nd Marines insert into Gjora, secure the landing zone, and set the conditions for follow on operations. While ashore, Marines rehearsed tactics in conjunction with NATO allies to defeat the notional enemy forces. The large-scale exercise validated the 24th MEU’s ability to deploy with the Navy, rapidly generate combat power ashore, and set the conditions for offensive operations under challenging conditions. Trident Juncture strengthened the bond between the Navy-Marine Corps team and integrated NATO allies and partners, particularly the United Kingdom’s Royal Marines, who embarked with the 24th MEU in Iceland. The Royal Marines, with X-Ray Company, 45 Commando, worked in conjunction with the 24th MEU and assets from Marine Aircraft Group 29 to rehearse their tactical recovery of aircraft and personnel proficiency. During the TRAP, approximately 30 Royal Marines loaded into two CH-53E Super Stallion helicopters from Marine Heavy Helicopter Squadron 366 while two U.S. Marines served as isolated personnel to be recovered. The Royal Marines were attacked by the notional enemy multiple times which allowed them to maneuver on the enemy while a U.S. Marine called for close air support which was delivered by a UH-1Y Venom with Marine Light Attack Helicopter Squadron 269. The effective enemy suppression allowed the Royal Marines to deliver both isolated U.S. Marines safely to the awaiting CH-53. As the exercise comes to a close, Marines are now more lethal and capable of operating in unique terrain and climate while exposed to the elements that the mountainous terrain presents.